Yeah, but: I'm a hard case. The Long Version: Life Brand is the store line for Shopper's Drug Mart / Pharmaprix, and they have a huge range of products. (One of which I've reviewed before.) Most of them are quite good, offering cheaper alternatives to The Leading National Brands, even if they don't have Dave Nichol shaking in his boots. 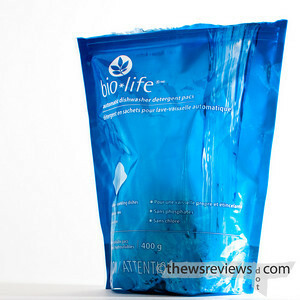 They've recently branched out with a line called 'Bio-Life', selling more 'eco-friendly' products. They're competing with brands like Method, which is also sold by Shopper's, as well as specialty lines from other stores. My dishwasher is old, and not particularly great. Things need to be rinsed fairly well before they go in, and the myriad plastic lunch containers never dry properly. 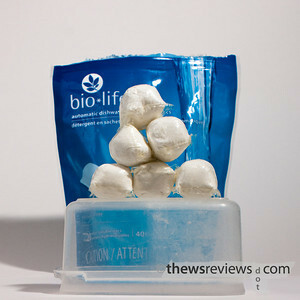 That might be relevant to my experience with the Bio-Life detergent - I have a hard time imagining that it would have ever made into circulation if the test labs results were as bad as mine. Every piece of hard-to-dry plastic comes out coated with a mottled white film. It smudges with handing; for these photos I've carefully polished half of it off with a paper towel. It doesn't seem to be left behind on things like plates and glasses, but it's hard for me to have much confidence in the detergent, and I resorted to re-rinsing everything by hand. The detergent itself comes in little pre-measured doses, wrapped in a water-soluble packet. There is a cautionary note on the container that the bag needs to be kept closed and handled with dry hands. I can attest to both of those in my brief time using the product. The little bundles glom together when exposed to even modest humidity, which makes them easier to stack but harder to use. And the one time I picked up a pack with damp fingers - I hadn't seen the warning yet - I discovered that the wrap does indeed dissolve instantly on contact with water. Not the most user-friendly product I've ever seen, to say the least. I suppose I don't seem that smart when I say that I actually tried four loads of dishes before I gave up on this stuff. For the last attempt I waited until the dishwasher was finished before running the rinse cycle again, just to make sure. No luck. The good news is that other brands of lower-impact detergent have worked in my machine without any issues, so it's not a problem with the idea, just this one particular product. 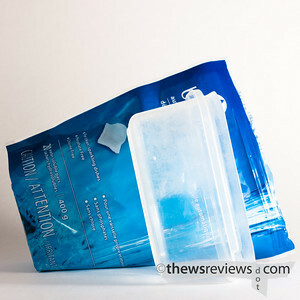 But no matter who makes it, I won't be buying this style of water-soluble packaging again. Not a big deal, as big deals go, but I'm just a little bit older and wiser now. I have no information on the subject that isn't commonly available on the web, so just by asking the question, I have no doubt that you're better informed on the subject of animal testing than I am. Personally, I'd be a little surprised if they even tested this detergent on dishwashers. Visiting family recently, I discovered that my mother-in-law has a package of this stuff. Unlike my old and feeble dishwasher, hers is a modern and high-end model. Having bought this brand to same a little money, she dislikes it as much as I do, and will not be buying it again.